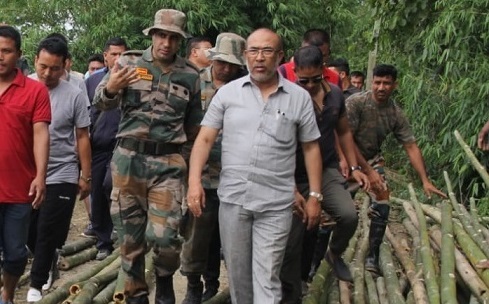 Manipur Chief Minister N Biren Singh accompanied by local MLAs visited the breached Imphal river embankment sites in Imphal West district on Saturday. The flood situation in Manipur remained grim even as 16 districts in the State have been affected by floods with the death toll reaching six. Over 1.89 lakh people across 218 villages have been hit, and as many as 32,591 displaced residents have taken shelter in 149 relief camps. Biren first visited the Chajing-Karam breach site and followed by Irong and Maibam at Mayang Imphal area to take stock of the situation apart from interacting with the flood affected people. Deputy Speaker of Manipur Legislative Assembly K Robindro Singh apprised the Chief Minister regarding the relief and repair work being carried out at Irong and Maibam. The Chief Minister also directed the officials on ground to seek help of competent experts to seal the breaches at the earliest. He also directed the officials to install portable bio toilets in the affected areas to maintain good hygiene and sanitation. However, he appreciated the efforts of the Tulihal battalion of 9 Sector Assam Rifles in the relief work. The Chief Minister also interacted with the affected population and asked them to stay strong in the face of this natural calamity. Later speaking to reporters, Biren appealed to the people support ongoing initiative to chalk out a permanent plan to tackle regular flood situation in the State and ongoing situation by providing necessary relief materials and mobile toilets etc. Chief Minister Biren also agreed that the present flood scene in the State is because of various reasons including heavy rain at many parts of the State and not only at few catchment areas of the major rivers. The average rainfall rate recorded in the State from January to June, 2018 (till June 15 is 598.8mm) is comparatively higher than the previous records during the same period in 2016 (246.79 mm) and 2017 (498.41mm), according to Directorate of Environment.